Read what clients had to say about their weight loss and sports nutrition programs! Losing weight is never easy and I have tried several different approaches! After 2 kids I struggled with getting back to my “pre” baby weight! I decided to search around and find a nutritionist and was lucky enough to find Stephanie. Stephanie is absolutely amazing…when I walked in to her office I honestly felt defeated! I had been exercising 5 days a week for 60 minutes a day and just couldn’t lose the weight. I had no idea what I was doing wrong! She is warm and welcoming! We sat down and discussed what foods I like and what foods I don’t like! She then created a customizable plan for me with meal and snack times that fit into my day! Completely 100% customizable to MY personal needs! Every week we review what I ate, what I could do differently and if there is a week of “no weight loss” she tweaks my plan so I could continue to meet my weight loss goals. 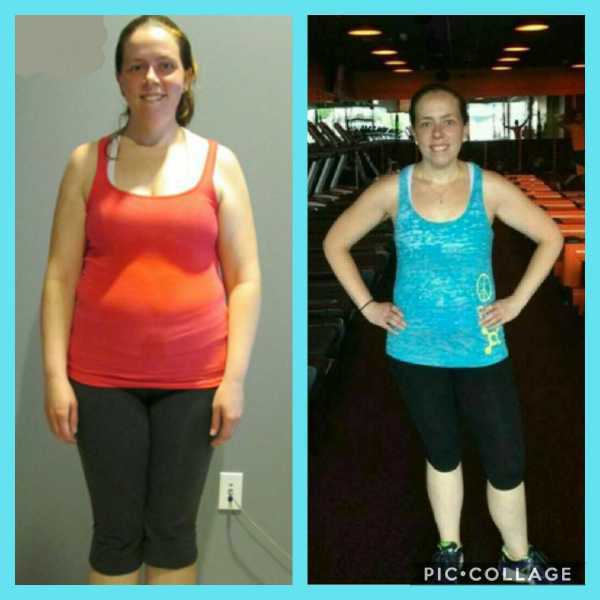 Stephanie not only has helped move the number on the scale, but has also taught me healthy habits, how to stay focused, and has improved my mental approach to view weight loss not as weight loss but a life style change! She is without a doubt my personal cheerleader; her encouragement and support continue to help me tremendously! Stephanie continues to lead me on my weight loss journey and I am so happy to have her by my side to support me every step of the way! ​Meet Amy - Total weight loss of 16lbs! ​​When I started seeing Stephanie I was stuck in a rut losing baby weight I gained after having two kids. While I had been able to maintain a healthy weight in the past, it was so overwhelming to see the number on the scale post kids and not know where to start. Stephanie made things manageable right away and customized a plan just for me. This ensured that I saw immediate results to motivate me while I learned to adopt a healthy way of life and lose weight steadily. Stephanie incorporated the foods I loved in moderation so I didn’t feel deprived. 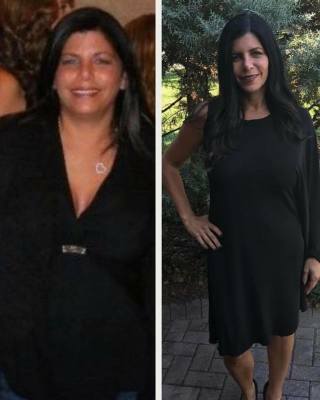 With Stephanie’s help I was able to develop a lifestyle incorporating healthy foods that made me not only lose weight but feel great. After losing all of the baby weight (and then some!) and committing to regular exercise, I am in the best shape of my life and feel the greatest I have ever felt. I am so grateful for Stephanie’s help! I have always enjoyed exercising. I have also always enjoyed eating. After many years of vigorous exercise, and a recent 7 lb weight gain over my norm, I decided my obstacles in success were with my diet and not lack of activity. I found Stephanie via a google search with excellent reviews and an office down the road from me. No excuses. Clearly, I needed a lesson on how to eat to lose pounds. I did not know what to expect! Would I be banned from all sugar? All alcohol? All fun? This was not the case. Stephanie put me on a plan that was reasonable although tough for me to accept. To lose weight means some deprivation- end of story. No one is typically losing weight after four slices of pizza and margaritas. I left my first visit upset with myself. There were weeks that passed that I did well and weeks I maintained. I would get frustrated with myself, I even cried once during a visit with Stephanie upset with my lack of self control. Stephanie NEVER made me feel bad. Ever. She was encouraging even if I felt I was not worth it. I struggled in the beginning as the first two months were difficult. I didn’t realize the time it would take to really build my new habits. Stephanie provided me a realistic foundation to build upon. She worked with me through the emotional first few weeks. She made me realize that so many of the foods I was eating that I dismissed as healthy still needed to be moderated. She helped me see the truth in my eating habits while I wanted to continue with the lies. It’s been months since my last visit with her and I feel fantastic. I have never had such a stable relationship with food. I don’t binge eat much if at all, I take a step back before I indulge, and I try to keep my new habits as tact as possible. Each day I have to remind myself it’s more important to feel good than over eat. The truth was I was overeating, but I acted as if I was not. Stephanie let’s me send her ridiculous texts about my progress, random updates about my size, weight, newfound abs. I know she cares because she wants to help each person she meets. She wants them to feel comfortable and be at their own personal healthy weight. Starting off my new habits with her was one of the best choices I have made. Over the last 8 weeks, Stephanie has helped me to completely change the way I approach eating and choosing foods. She has shown me that it is possible to have an active social life while still being mindful of what I am eating and losing weight. The program is very individualized to my needs and my lifestyle; even better is that Stephanie is willing to work with me via FaceTime each week. This technology and her flexibility have made it possible for me to be successful and get the full benefit of her program while living in Pennsylvania. I have had a great start and look forward to seeing the results continue to improve! I have a thirteen year old daughter who is in a pre-professional dance company and dances over 20 hours a week. As she is entering her teen years, and potential body image issues, I noticed that she was not eating properly for the amount of physical exercise that she was exerting. Furthermore, what she was eating was not the most nutritious, as she was making very poor choices at fast food chains and low calorie- quick serve microwavable meals. I knew that I had to intervene and put her on a program and educate her on proper nutritional choices. I set up my daughter’s consultation with Stephanie and she quickly was able to assess my concerns, gain my daughter’s trust, and develop a plan to improve her eating habits. Stephanie provided my daughter with a completely customized menu and time schedule plan for her week, taking account my daughter’s food availability at school and dance, as well as her taste and preferences. Stephanie also provided me with a complete grocery list to stock our kitchen properly, and gave us a plan to start incorporating other foods that would be beneficial to her diet. Half way through the program, I began to see results in my daughter – she was not as tired and sluggish, her mood improved, and she started accomplishing some of her dance technique goals that were dependent upon strength and endurance. Now, at the end of the program, my daughter understands the important correlation between nutrition and physical and mental ability, and how by incorporating better habits could positively impact outcomes. I highly recommend Stephanie for any adolescent who is going down a similar path. Stephanie is not only a great nutritionist but also someone that I felt comfortable to be a role model for my daughter to help steer her life choices. Meeting and working with Stephanie has changed my life for the better. When I first met Stephanie, I was 35 years old, 40 pounds overweight and trying to have another baby. I knew my weight was a big factor as to why I wasn’t able to get pregnant again. I’ve been on many diets in the past and my weight had always fluctuated since my early 20’s. After my first meeting with Stephanie, I knew this was not another fad diet plan or some short term gimmick. This was a lifestyle change. Stephanie taught me how to rewire my thinking when it came to food. She taught me how to eat “clean” and how to fuel my body with all the proper foods. She not only helped me with making proper food choices but she also gave me unconditional support and guidance. I knew if I ever had a question about anything, she was always available to reach. Stephanie has such a positive presence about her, that I never felt uncomfortable or embarrassed if I had a challenging week or difficult circumstance. Stephanie helped me lose over 40 pounds! Shortly after my amazing weight loss, I became pregnant with my second child and ended up gaining almost 50 pounds! Even though I had lost all this weight, I knew after having my baby, Stephanie would be there again to help get me back on track. I truly enjoy meeting with Stephanie each week. No matter what challenge I may face, Stephanie is always there helping me along the way. I wouldn’t have been able to do it without her. She’s not only my nutritionist, but she’s also become a good friend too! Stephanie Leonetti is a very knowledgeable Certified Nutritionist with a professional, easy charm and a calm, confident demeanor that makes you like her immediately. My son Timmy had a great experience working with Stephanie last spring for 16 weeks in her Sports Nutrition program and successfully lost 30 pounds. At 14 years old, Timmy was big for his age weighing 230 pounds and 6’2”. Stephanie very confidently said he could lose the weight in 12-16 weeks. I was shocked. But true to her word, Timmy consistently lost 2-3 pounds per week and felt great the whole time. I was not involved except to buy the food--the two of them met each week and worked his plan--this ownership was very empowering for him. Stephanie concentrates on teaching athletes about eating the right foods instead of using supplements, using the right combinations (carbs with protein) and when the proper times are to eat (before and/or after workouts). The education Tim received from Stephanie has set him up to successfully manage his weight for optimum fitness and athletic performance throughout his lifetime and he continues to successfully do well to this day. I can't recommend Stephanie highly enough! For teens or young adults looking to achieve their top athletic fitness, Stephanie is a great motivator and a consistent presence that will help educate them to be healthy, mindful and perform at his/her very best! Meet Pete...he's a football player who's been working with Stephanie every summer since 2015. June of 2015 he was 16 years old, 6'2, weighing 191 with a body fat of 11.7%. His goal was to drop body fat and gain muscle. Stephanie gave him a nutrition plan telling him exactly what to eat and when to eat. She also gave him the amount of calories and macros: carbs, protein, fat to eat per day. Pete works out everyday and Stephanie tells him what to eat before and after he works out whether it's cardio or strength training. The only supplements Pete takes is a Multivitamin and Vitamin D along with his bcaa's for working out. He made this change all through diet and exercise. Summer of 2017 Pete is 18 years old weighing 200lbs with a body fat of 7.8%. If you put in the work like he did you will see the results! I was looking for a nutrition program that would suit my son, and help him achieve his goals of proper eating habits to better support his goals of attaining, and maintaining athletic performance. Stephanie worked with Joe to create a sensible plan that took into account the eating habits of an 11 year old boy, and at the same time making sure he was getting the proper nutrients to fuel his body. In a 2 month period my son reduced his body fat by 2%, and giving him greater energy to perform on the soccer field. I would highly recommend Stephanie, she worked very well with my son, and gave him the support to help him stay on track. Listen to how Stephanie helped Mark gain weight!